The SPring-8/SACLA Research Report is a collection of research results and is provided as an online journal. An Online manuscript submission system has been adopted for the Research Report. Before submitting a SPring-8/SACLA Research Report, please create an account in this system, and then use the online manuscript submission system. To publish a paper in the SPring-8/SACLA Research Report, an account for the online manuscript submission website must first be obtained. Please create the SPring-8/SACLA Research Report account (user ID) as that used for your My Page on the SPring-8/SACLA User Information (UI) website. An email address is required when obtaining an account (After submitting your paper, we will contact you using your registered email address. Do not use a shared address such as a mailing list when registering). To obtain an account, please read “How to create an account“, and then click here. 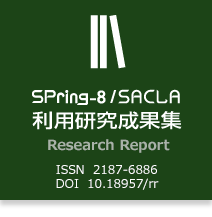 Please read the SPring-8/SACLA Research Report at the following UI site, and download the draft form in MS Word format. The Proposal Application of your proposed research is required for a Research Report peer review of the research report. Please upload a file of the Proposal Application of your proposed research. It can be downloaded from My Page of the SPring-8/SACLA UI site. Contact regarding the contents of the submitted manuscript and review results will be made using the email address of the submitting author. When submitting a manuscript for the first time, please read “How to submit a manuscript“. When submitting a revised manuscript according to a peer review, please read “How to submit a revised manuscript“. Please submit a manuscript using the SPring-8/SACLA Research Report manuscript submission system. This system uses pop-up windows. Please turn off any browser pop-up block functions which may be running. Please use the following manuals when obtaining an account or submitting a manuscript. Please refer to the following manual when changing your password.